The rags to riches stories of some billionaires can seem almost mythical, but at AES International we believe there are some simple lessons which can be learned from their tales. Laliberté is the founder and former chief executive of the world renowned Cirque du Soleil. In addition to building the high-wire tour de force, Laliberté has earned himself a reputation as a generous philanthropist, a high-stakes poker player, and even a space tourist. But what can we learn from this fire-breathing Canadian? Passion. From his early days busking on the streets of Quebec, a fire burned brightly inside Laliberté, inspiring him to achieve more and to push further and harder to reach his goals. The passion, which helped this visionary performer ultimately cultivate a culture of success and high achievement shared by his entire circus troupe, should be an inspiration to us all. If you are passionate about and genuinely care about your goals, then you will achieve them. We say, breathe some fire into your finances – invest in your financial future with passion! His is a classic rags to riches story and one which has been told and re-told many times. But what makes Richard Branson and his Virgin brand so ground-breaking? The pioneering nature of its leader who has a clear thirst for knowledge, adventure and new experiences. Starting out with a mail order company in 1970, Branson now has his fingers in countless pies – from telecoms, trains and planes to banking, media and space tourism. Branson’s is a true story of a successful, serial entrepreneur. 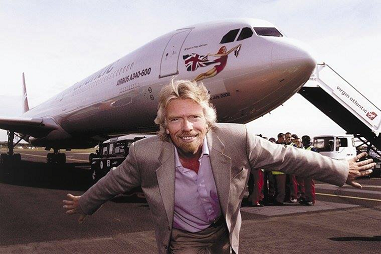 Branson has always been inspired and sought the next adventure, never resting on his laurels for long. This is a lesson we can all learn. While it may sound more mundane than space tourism, reaching out for your next financial goal – and setting it high – can be quite an adventure in itself. We say, be adventurous – push yourself and your financial goals! In 1987, Gordon Gecko burst onto the silver screens, full of Wall Street brass and clutching a Motorola DynaTAC 8000X mobile telephone. Most people probably didn’t pay too much attention to the phone, but Caudwell did, and in that very year, at the peak of the “yuppie” era, he launched a mail order business which would become Phones 4U. After almost 20 years in business, the Birmingham born entrepreneur sold Phones 4U for more than £1bn. The business has unfortunately since entered administration, but that was long after Caudwell and his co-founder and brother, Brian, had made their money. Caudwell identified what he believed would be “the next big thing” at a very early stage. When investing it is difficult to do this, but there are good fund managers out there who do this year in, year out. We say, capitalise on burgeoning trends, use active fund managers to make your money work hard, 4U! The wealthiest person on this list by a long way, Warren Buffett is probably also arguably the most frugal. The early days of Berkshire Hathaway deserve a book to themselves and have been very well documented. Suffice to say that the “Oracle of Omaha” has earned his title as the world’s greatest investor over many years and has helped make multiple millionaires and even a few billionaires along the way. We say, know what you are investing in. If you don’t understand a product or an investment, you cannot know whether it will succeed and in all likelihood it won’t. Not everything will happen at once – patience is more than a virtue for an aspiring investor, it is a must. In the early 1990s, the author of the Harry Potter series of books was recently divorced and living on welfare with a dependent child. She is reported to have completed most of the first Harry Potter book in cafés, as walking around with her daughter was the best way to get her to sleep. The franchise Rowling created is now worth an estimated $15bn. Rowling is an inspiration to many. Writing a book is a lonely affair and at times it must have been easier to give up, but she didn’t. Instead, Rowling remained determined and persevered to achieve her goal. And, because of her sheer grit, Rowling was also awarded a bit of luck. If you want to begin the path to your own financial happiness and success, click the link below to download our guide to becoming an “Expat millionaire”.